A very difficult decision had to be made tonight as Captain Beefheart’s Magic Band were also in town. But a quick listen to Down Hearted Blues, a collection of reworked classics by Eilen Jewell, and that Sunday night gig quandary became a formality. Originally from Boise, Idaho, Eilen Jewell is a waif like presence that belies a sensuous, confident and sensational performer. A fantastic, authentic interpreter of the blues and countrified Americana, with such a special voice that is equally at home in both camps. She and her band effortlessly invoke the spirits of Howlin Wolf, Willie Dixon, Memphis Minnie and Betty James. 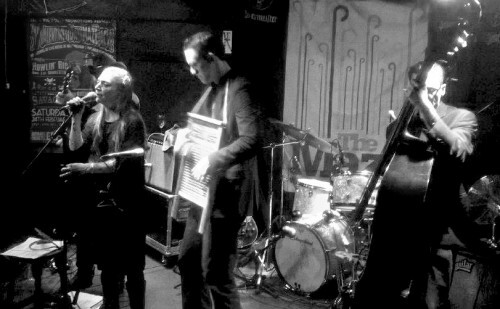 The band tonight are tremendous, on huge double bass is Shawn Supra, the suave Mr Jason Beek is on drums, brushes and washboard..oh yes, we have a washboard scenerio! And on the sweetest guitar you’ll ever hear is the legendary guitarist Jerry Miller who has an illustrious career playing with the likes of Johnny Cash and was part of the nascent hippy movement as prime mover in the band Moby Grape with Skip Spence. He also knew Jimi Hendrix and is one of the greatest exponents of the guitar this side of Atlantis. This was a mammoth set, two hours by my reckoning and covering all bases, including Shelf Blues, Rio Grande, Needle and Thread, Rich Man’s World from her vibrant back catalogue. Eilen Jewell’s new recordings were superlative too. Another Night to Cry, Don’t Leave Poor Me and especially Walking with Frankie really cooked up a storm. In virtually all the songs Miller played some incredible guitar licks. Restrained and concise, the epitome of a truly gifted musician and a privilege and pleasure to experience. Between these beautiful tunes Eilen Jewell talks about her love for the blues, busking, falling in and out of love and how music got her through the hard times. She tells of discovering her father’s record collection and her early years in Boise, where she longed to break out and connect with something bigger. This desire to break free of your roots appears to be a common thread to many musicians. She seemed genuinely grateful to receive vociferous calls for an encore and finished with a glorious version of Bang Bang Bang and a solo stab at Bob Dylan’s Walking Down the Line which was mesmeric. Support was from Sophia Marshall, a name you should remember for future reference, hailing from Leicestershire this singer songwriter has an easy relaxed style with a nice set of self penned tunes. Flanked by Andy Jenkinson and Sarah Marshall who contribute backing vocals and bass, the resulting melange of acoustica is a sweet thing, gentle, harmonious and blessed with some nice tunes. Her latest album is called Bye Bye, from which most of tonight’s short set came from and heartily recommended it is too. Big eyed beans from Venus nil…….Eilen and Sophia, three. Would have loved to have seen this.